This article is about speed—my need for speed. When I lookup stock data, I want it fast, I get it fast, and I'll show you how you can do the same. We'll be using Firefox for this. For the most powerful results, you'll want to use Firefox in combination with either Delicious or Xmarks. I'll get into that later in the article, but first, the basics. Let me describe the dots, and we'll connect them as we go. 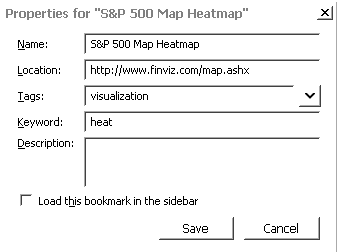 Let's start by bookmarking the Finviz heat map. I then edit the bookmark and add the keyword heat. Now, if I simply type "heat" in my address bar, I'll go straight to the heat map. Voilà. Try pressing F6 or Ctrl+L to quickly pop to your address bar (as opposed to using the mouse). If I were to lookup another stock symbol, the only part of that url that would change would be the part at the end, the "ATVI". Well, Firefox has a feature called the %s variable. 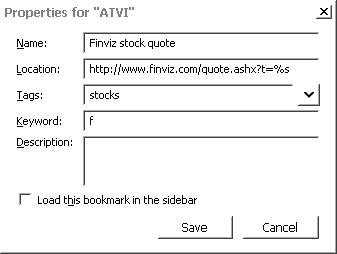 To put it into effect, I'll first bookmark http://www.finviz.com/quote.ashx?t=ATVI. Then, I want to edit that bookmark by changing it to http://www.finviz.com/quote.ashx?t=%s and by adding the keyword f.
I'm brought to http://www.finviz.com/quote.ashx?t=RHT. Notice that the %s in our saved url automatically changed to RHT. You can see that I've bookmarked Pimp My Trade, tagged it, and and given it the keyword "pimp". Now, by typing "pimp" in my address bar, I go right to Pimp My Trade. Note that the "Keyword" area in the edit box doesn't show up for me when I initially save the bookmark. To be able to edit the keyword, usually I need to save the bookmark first, and then right-click on it and select "Bookmark in Delicious" (or hit the tag button again like I show in the video). I wrote to the Delicious support team about this minor bug, and they are looking into resolving it. I try to use a keyword that's short and easy for me to remember. You can customize your keywords to whatever works for you. The %s variable can be applied on any site that uses a string like this. 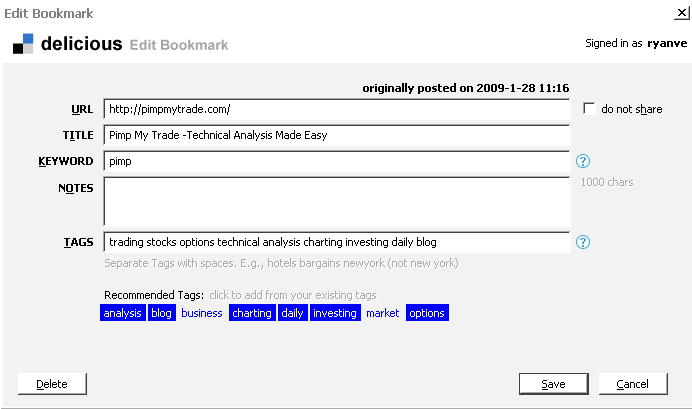 You can use the %s variable to create "quicksearches" on FinViz, StockCharts, Google Finance, Twitter, etc. Here's my list of trading-related keyword quicksearches. I even prefer to save my Finviz screens with Delicious, so that I can access them more quickly via a keyword. If you haven't already, you'll probably want to read Adam's article about using the Finviz screener to find great setups. There is also a popular Firefox addon called Xmarks, with features similar to Delicious. I haven't tried Xmarks, but I presume it integrates the keyword and %s variable features of Firefox. If anyone has tried %s with Xmarks, let us know how well it works. Hopefully this article has brought you up to speed, and you'll be more efficient at researching your trades. By shortening the time it takes to lookup quotes and charts, I've found that I get more time to actually analyze them. Thanks for reading, and thanks to Adam for giving me the opportunity to write this post. If you have any questions I'll respond to your comments below.